QUESTION: Mr. Armstrong; I am curious given your passion has been history you have explored things nobody seems to have. What has impressed me is how you pull history together in such a logical way you make it come alive. My question is the origin of Germany. We were taught here in school that Germany traces its origins back to the Battle of the Teutoburg Forest in the year 9AD. What is your take on this subject if you care to answer.? 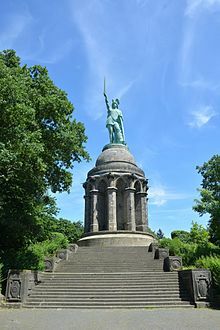 ANSWER: Yes, I am aware that Germany traces its origins back to the Battle of the Teutoburg Forest of 9 AD, but it is really political propaganda. It was not until 1871 when Germany became a nation-state. That is when most of the German states unified into the Prussian-dominated German Empire. 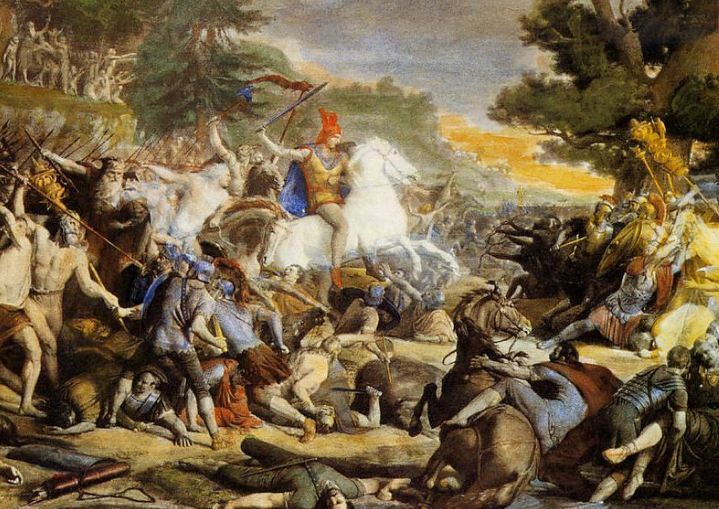 Nonetheless, the famous battle in which Germanic tribes annihilated the advancing Roman army has been used for political agendas over the centuries. The battle is actually believed to have taken place near Kalkriese, northeast of Osnabrück, but the battlefield has not been confirmed. The Germans did ambush the Romans in a tight geographic area between a hill and a moor. It is well documented as a disaster even in Roman literature. Some 18,000 Roman troops were slaughtered by the Cheruscan Chieftain Arminius and his allies whose name was changed to Hermann to make him a local hero. Arminius has been propagandized as Hermann the German and this battle has been interpreted as being the birth of Germany as a nation-state. All of the coins found at the location confirm the time period. The coins discovered at the location to the early years of the first century AD during the time of Emperor Augustus. There were also coins of late Republican time period that were still in circulation. However, we date a site by the latest coins discovered. The defeat of three Roman legions under the command of Rome’s Germania governor and General Publius Quinctilius Varus by Arminius is a true account. It is also a fact that the Romans never again attempted to establish settlements in Germany following the Battle of the Teutoburg Forest. He was the son of Sextus Quinctilius Varus who was quaestor in 49 BC and defended Corfinium when Julius Caesar (100-44 BC) besieged the city during the civil war against Pompey. Sextus was forced to surrender the town, was pardoned by Caesar, but immediately betrayed him and fled to Africa, where Caesar’s deputy Curio was fighting against Pompey’s allies. Sextus did his best to win over Curio’s soldiers to abandon Caesar’s cause. Despite the fact that Curio was defeated in Africa, Caesar won the civil war. Sextus did not return to Rome since it was not Caesar’s policy to pardon a person twice. It is not known whether he was involved in the plot to assassinate Caesar. We do know that Sextus was involved at the battlefield of Philippi, where the new leaders of the Caesarian party, Marc Antony, and Octavian, defeated the last republicans oligarchs. Sextus then asked one of his freedmen to kill him. How his son Publius Quinctilius Varus rose to power under Augustus is not known. Clearly, he was not held to account for the sins of his father. He clearly accepted the end of the Roman Republic, in contrast to his father. What is known from that period is that the Civil War did divide families as well. Publius, nonetheless, became a personal friend of Octavian/Augustus and associate of Tiberius. He was given Syria as his province in 7 BC during which time he issued this provincial coin. While serving as the governor of Syria, Varus guarded the borders against the menace of Parthia and violently suppressed revolts in Judaea and Samaria, when it was learned that they had been apportioned to Herod Archelaus in the will of Herod the Great. The military operations in these regions are sometimes known as “Varus’ War.” Varus, however, is best known for his role in events after he returned from Syria and took up a command in Germany in 6 AD. During 9 AD, he led three legions against the German tribes at the Teutoberg Forest. He was killed and the legions annihilated in one of the greatest military disasters of Roman history. 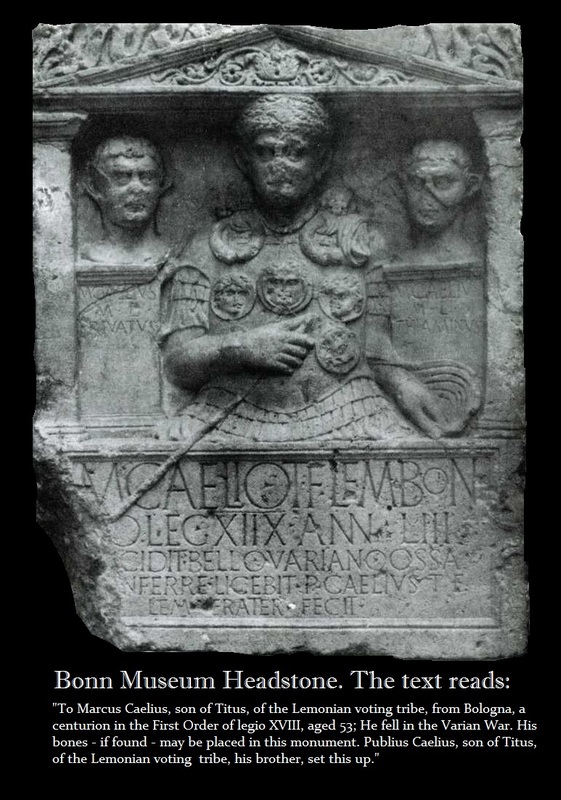 There is a surviving gravestone in the Bonn museum which clearly confirms that there was indeed a Varus war supporting the Roman accounts. We do know that the event took place. The background of the German hero, Arminius (Hermann), is not widely explained in German folklore. Arminius had actually received a Roman military education and had Roman citizenship. He even commanded an auxiliary German cavalry attached to the Roman army before deserting and switching his allegiance. We do not know why he took this step. Some believe that he merely entered the Roman military to learn the tactics to defeat them. Clearly, Arminius who has been portrayed as the heroic liberator who created the German nation was crafted by Martin Luther to support the liberation from the Roman Catholic Church. The story supported his political cause. During the mid-20th century, the National Socialists in Germany further enhanced this concept during the Third Reich raising Arminius as the .heroic liberator who created Germany. This myth has been used over the centuries whenever it was needed to support the rise of nationalism. Exactly where the battle took place is not precisely known. The Kalkriese Museum was to begin a three-year excavation project to try and get some answers. This is where numismatic archaeological evidence is playing an important part in the current research. Coins help to date an event, but a battlefield would have more coins than usual. There is no absolute proof where the battle took place at this location. There have been no inscriptions of the 19th or 18th or 17th legions discovered. The new excavation authorized in 2017 hopes to discover some piece of a helmet with an inscription or a plaque with the name of a unit. There are also stamped artillery bolts that can often be used to also confirm legions and/or events. The Roman would use a slingshot to propel bullets. Typically, these bullets are marked allowing for the identification often of specific legions. Coins are a very important part of documenting history. There are bronze coins of Augustus that have countermarks “VAR” which has often been attributed to Publius Quinctilius Varus. 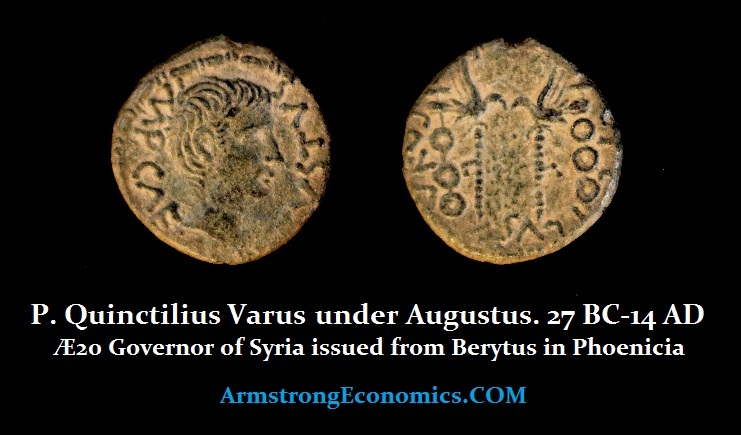 As pictured above, Varus had the authority to issue local provincial coins in Africa Proconsularis as well as in Syria. His name appears in the legend and in some cases also with his bust. Since he had the authority to issue local coins, he may have had the authority to countermark imperial coins that were worn in the West as well, yet no such local coin exit issued by him in either Gallia or the Rhine border region. Therefore, local coins issued in the name of Roman officials seem to be common in Eastern Provinces under Augustus most likely because of the difference in culture led them to retain their own monetary units. Nonetheless, there are countermarks known in the Syrian province on local provincial coins when worn that have been attributed to Varus. These are noted in Greek Imperial Countermarks numbers 658 and 659 that show “VAR”,”PVAR” and “QVAR” inscriptions. These appear to coincide with Varus’ term of office as governor of Syria. This has been used to infer that the “VAR” countermarks on bronze coins of Augusts found in the region of Germany are attributed to Varus. It was a common practice to counter-stamp bronze coins that were worn. In some instances, the coins are devalued. 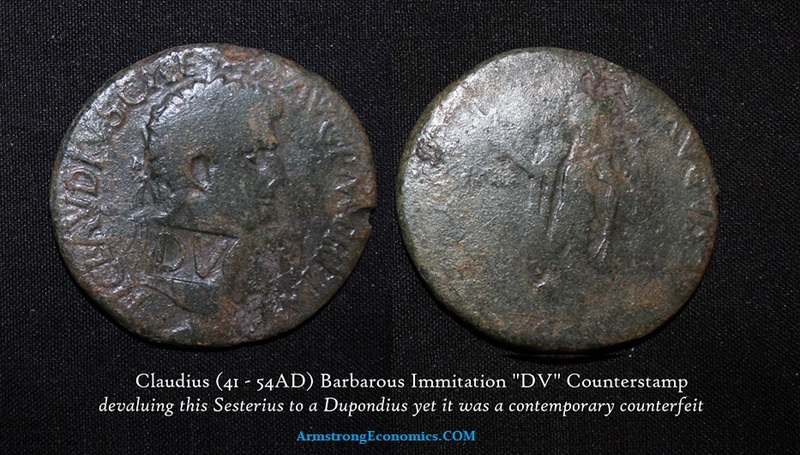 Here is actually a barbarous imitation of a Roman sestertius of Claudius (41-54AD) that is severely worn and the coin was a Sestertius with the countermark “DV” meaning it was devalued to a Dupondius – half the original value. Therefore, the “VAR” countermark is most likely certifying the value remained unchanged. It was also a common practice for the legionaries to burying their money in the ground before a battle. These are hoards not of individuals, but the pay for the army. The dead would have been stripped of their armor and any coins would have been taken and the bodies were left to rot in the forest and provide food for the animals. In early 2017 a hoard of more than 200 silver Roman coins, all dated prior to 9 C.E., were found in the Kalkriese area where the battle is suspected to have taken place. This was probably not the funds buried by the legion representing their pay. 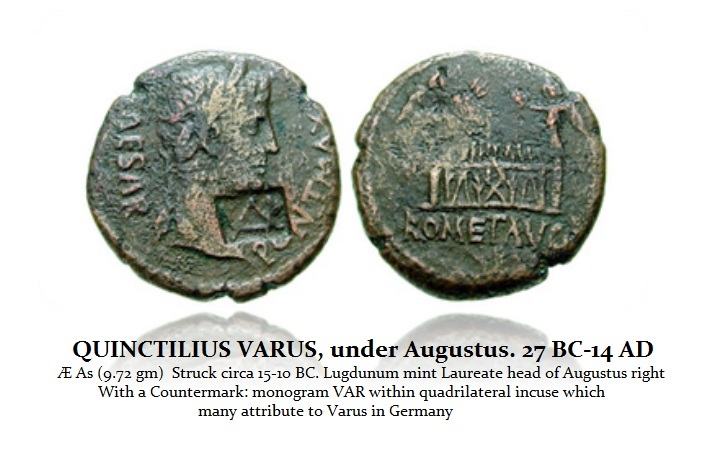 It is unlikely that Varus possessed any authority to actually strike coins as a moving military mint. That has been a common practice mostly of usurpers and during periods of civil war. In such cases, the actual dies have also been discovered. 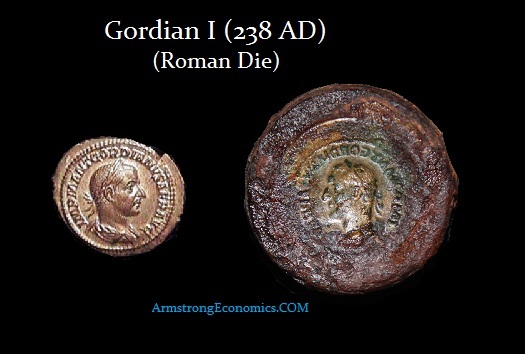 Here is a die of Gordian I (238AD) who survived only 21 days. During 2016, University of Osnabrück archaeologists discovered eight Roman gold aurei east of Bramsche. This opened up the speculation that perhaps Bramsche might be the sight of the battle. 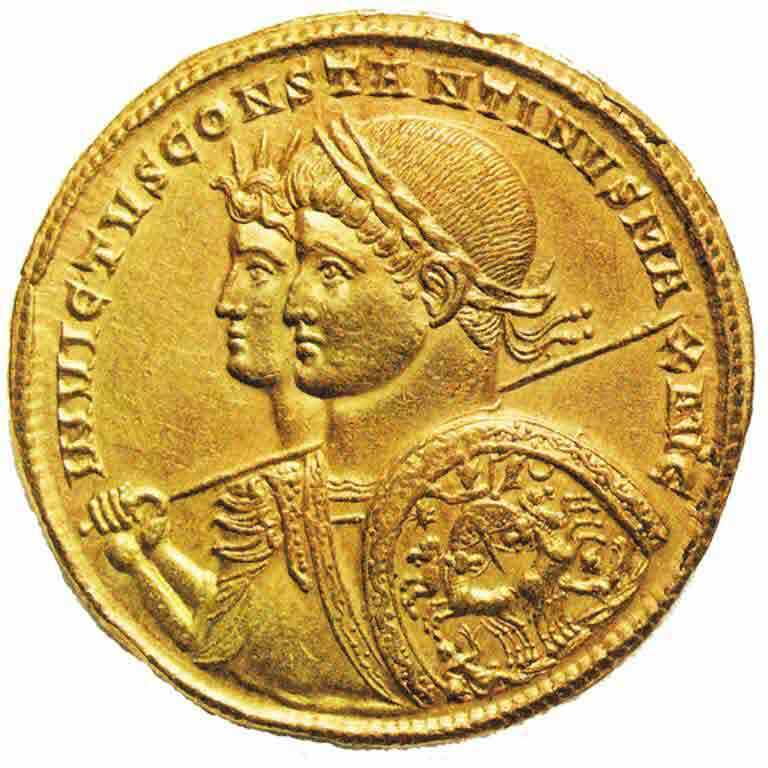 The coins were of the early type struck prior to 9AD depicting Augustus on the obverse, with his grandsons Gaius and Lucius on the reverse. There were some other minor bronze denomination coins also found at this sight. Bramsche has been nicknamed field of gold by the local citizens who have found gold coins in this area before. Back in 1987, there was the discovery of 162 silver coins and three Roman slingshots bullets. None of the coins discovered at this site date after 9AD. However, other than the slingshot bullets, there has been no military objects found at Bramsche. Some argue that the gold coins were lost by officers attempting to flee the massacre. Germanicus (15 BC – 19 AD) who was the grandson of Marc Antony and Son of Antonia, he was, therefore, the brother of future Emperor Claudius and the father of future Emperor Caligula, obtained his name for he led the legions to Germany after the defeat of Varus. Germanicus’ troops campaigned against the Germanic tribes for six years during the aftermath of the Battle of the Teutoburg Forest. According to contemporary accounts, Germanicus found the battlefield and buried the human remains which included skulls nailed to trees. Now, the question is rather simple. Is the reinvention of a former Roman soldier Arminius transformed into Hermann and founder of Germany, which did not become a nation-state until 1871, a unique rewrite of history? The answer is absolutely no way. Here is a gold medallion of Constantine I the Great (305-337AD), the man who declared Christianity the official state relgion of the Roman Empire. Look closely and you will see that Constantine pictures himself with the Roman god Sol. To the pagans, this was a political propaganda piece. Sol Invictus was becoming virtually the supreme god. 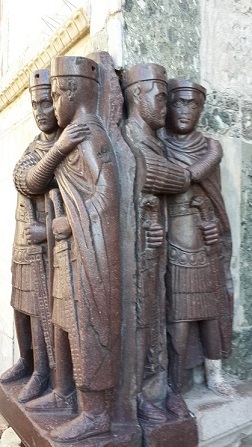 Constantine’s propaganda was all about defeating the reforms of Diocletian who established the Tetrarchy whereby emperors would retire and be replaced with their second in command. Therefore, picturing himself with Sol was a political statement suggesting that there should be only ONE emperor. Constantine supported Christianity using the same political agenda that there was one god so there should be only one emperor. Those who seek power often rewrite history to argue what they are doing is really being heroic like some former person in history. They change names, facts, and even timelines to justify their actions. It has been a practice that prevails throughout history.